Hey KEURIG, can you say “WE SCREWED UP”? Ye-HA! My single cup coffee maker wouldn’t yesterday morning and that is no way to start out a day! So I took to fixing it today. The way it acted figure’d it was clogged. But where? Watched a video on YouTube that said the needle that punctures the cup is most likely clogged with coffee grounds and showed how to disassemble it to get it out and clean it. Quite involved and time consuming. If the needle is clogged why not just unclog it? 5 minutes later I was enjoying a hot cup for French Roast. Oh and 4-1/2 of those 5 minutes were spent looking for a paper clip I could use to unclog it. Probably was the same problem I had with the Cuisinet that this Keurig replaced, had to whack the Cuisinart hard on the side sometimes to get it to brew, turns out that’s a common solution for those. 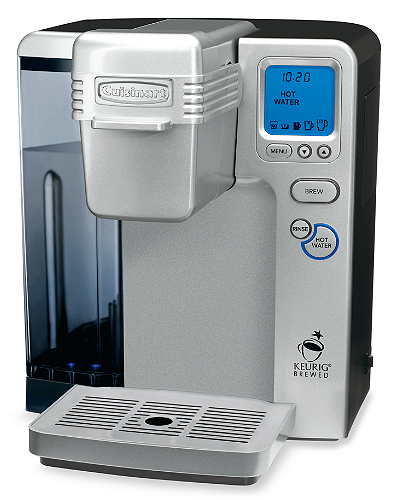 Now it’s looking like Keurig discontinued or is in the process of discontinuing the V700 and maybe all the VUE brewers. Wonder why? It’s only been maybe 2 years, if that. Because VUE coffee packs were/are more expensive then K-Cups and have no additional value? And K-Cup flavor selection is 5 to 10 times VUE cup selection? And almost everybody, myself included, uses K-Cups in their VUE brewer (with a non-Keurig adapter) instead of VUE cups? My initial thought on Keurig replacing K-Cups with VUE cups was that’s a stupid idea, the two being non-interchangeable. Purposely, What? 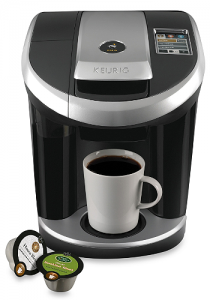 Everybody is going to jump to VUE cups well, because it’s Keurig and people will just blindly follow? Not. Yes I bought a VUE brewer because I got sick of whacking my Cuisinart brewer, but with the intention of using K-Cups. Had I not been able to use K-Cups I would not have bought a VUE brewer. Now Keurig’s new big thing and what they’re pushing is the KEURIG 2.0. Guess what. It uses K-Cups. And something new, K-Carafe, for brewing more then one cup, have to check that out. Funny, VUE brewers seems to have completely vanished from Keurig web site. Did a quick search on Keurig’s web site for “VUE” and got 56 results. Not a single VUE coffee maker. Hey KEURIG, can you say “WE SCREWED UP”? Big time. Previous PostThe Preppers CookbookNext PostBEWARE! Kreurig’s new 2.0 brewing system is DRM protected!